The following are pictures taken at the Muséum National D'Historie Naturelle Jardin Des Plantes Paléontologie et Anatomie Comparée in Paris, France. 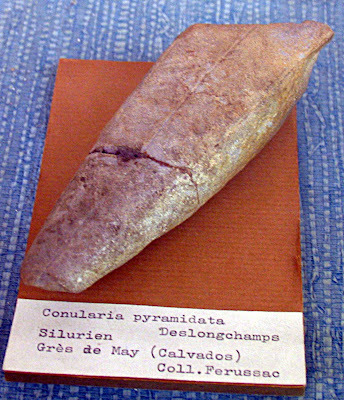 They are Conularia from the Silurian and Ordovician Periods. This is interesting for me since the common Conularia fossil finds in the Louisville area are from the Carboniferous Period. 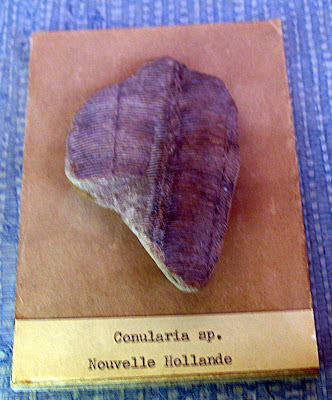 The first two are Conularia pyramidata found in France, I think from somewhere in Normandy. 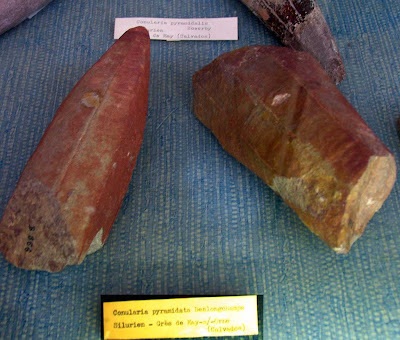 They are from the Silurian Period. This next Conularia of unknown species comes from New Holland according to the label. 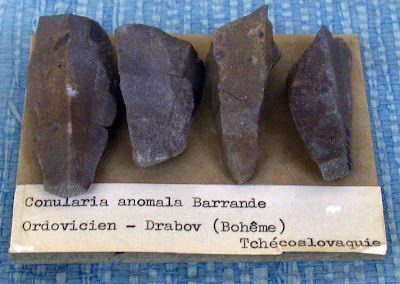 This last image of four fossils are of Ordovician Period Conularia anomala from Czechoslovakia. 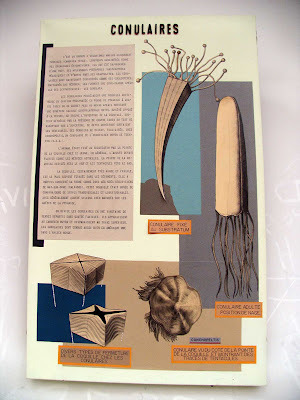 Here is a poster that was in the museum describing Conulaires (Conulariida?). I have yet to translate it. The image of the little stalks with beads at the end protruding from the top of the Conularia is interesting. I've found a few of those puppies in NW Arkansas, Boone limestone formation, Mississippian.